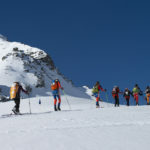 Every two years, around 5,000 hardy skiers make the grueling high-altitude journey from Zermatt to Verbier along a route known as the haute route. 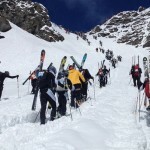 The event, known as the Patrouille des Glaciers, is organized by Switzerland’s army. This year it runs from Apr 17, 2018 – Apr 21, 2018, with different teams setting off on different days. The first teams left Zermatt early on 17 April 2018. 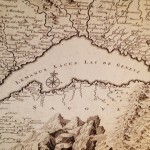 The race covers 53 kilometres on a map. This translates to around 110 effort-kilometres, calculated by adding 10 times the height climbed and 3.3 times the altitude descended to the map distance, a measure that allows flat and steep courses to be compared. The journey involves climbing 3,994 m and descending 4,090 m.
In 2016, Frédéric Favre made a film about the legendary Swiss race – see trailer below. The event was first organized in 1943 to test Swiss soldiers’ alpine skills. In 1949, three skiers died, leading the Swiss military to ban the race. In 1984, it was revived and has been run every two years since. The more than 5,000 people competing in each event, compete in three-person teams called patrouilles.